Especially during the summer months, staring out into the ocean leads to daydreams of sailing the open water, freedom and exploration. Now you can take three-quarters of this vast planet - the ocean - with you on your mobile device by downloading the new Google Earth 1.1 for Android. 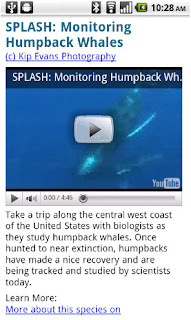 With the release of this feature, escape the hustle and bustle of life on land and discover the marine world using Google Earth on your mobile device. Now, you can check out the landscape and terrain in Monterery Bay Canyon, which is larger than the Grand Canyon, by zooming in on Google Earth below the ocean surface just off the coast. 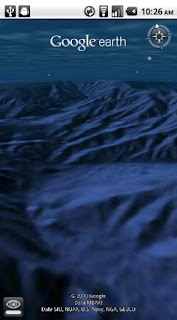 Once underwater, we can use the “look around” button to tilt the view and see the extent of this great undersea canyon. The latest version of Google Earth for Android also introduces the “Explore the Ocean” layer, which features hundreds of photos and videos from more than 100 contributors who are excited to share their stories of sea. Plan your next vacation during your daily commute by clicking on any of the little blue icons. The gold highlighted icons represent content from the Mission Blue Hope Spot initiative. For those of you running Android 2.2, there are some more treats in store. Google Earth now supports Flash in balloons, so if you have the Flash player installed on your mobile device, you can watch videos right in the balloon. We’ve also made the program easier to navigate; for most devices, you can now use two fingers to “look around” and change your viewpoint, as an alternate to using the on-screen button. This makes it even easier to tilt your view to see mountainous landscapes or underwater canyons. Rotating your view with a simple twist of your fingers is now available on more devices as well. Google Earth for Android 1.1 is available in Android Market today for most Android devices running version 2.1 or later. Explore the ocean anywhere. Ah... If only T-Mobile hadn't orphaned the MyTouch at Android 1.6.... Can't wait to try this once I switch carriers!! I have the Samsung Acclaim and the barcode did not work! Your phones need to have OpenGL support. The first gen devices don't support the graphics required. Basically, any device that can't use live wallpapers isn't able to use Google Earth. I'm not sure about the Legend. I think its powerful enough, but I'm not sure. Love the update. Haven't tried it yet on my Evo, but I was hoping for better navigation controls and now they did it. The ocean and flash abilities are awesome too. Can't wait until Earth is as full featured as on a computer! Keep up the good work team! I have a Galaxy S, but looks like the Google Earth team hates the entire country of India for some reason :( Google Earth is not available in iTunes India store for iPod Touch/iPhone and now, its not available on the marketplace for India devices. Come on guys! Maybe this is a US only release or something? Further to my previous comment, it appears you can move it to SD card at last! Excellent. HTC Desire with 2.2 default install in Romania and Google Earth could not be found. I don't understand why. I know the phone is capable of running it with no problems because I installed the .apk I found online. Kind of reminds me of how Microsoft used to block international access to their Betas before they realized the net doesn't work that way - not something I expect from Google! Pointless. "Not found" for everybody? Can anyone at Google explain why this isn't available for, say, Desire or even some Nexus One owners. Whatever logic is supposed to determine whether or not this app (and other apps) will run properly and is therefore allowed to appear on the market app is totally broken. Is there a fix for this bug planned, or is it not perceived to be a bug? Stock HTC Desire running 2.1 on T-Mobile UK. Not found in the Android Market. Bar code worked for me. Nexus One/T-Mo USA. Any chance of moving Google Earth to an SD card? I had to uninstall due to lack of room on my Droid. I hope you can make this available on the HTC Wildfire ASAP! Not able to find in India also on Nexus one. When it will be available in rest of the world? Yeah, this version has Apps 2 SD support built in now. Not available on Motorola Milestone Brazil. I have an HTC Incredible, 2.1, and the install worked for me using Appbrain.com. This is the first version of Earth that has worked on my phone. YAY! requires a device running at least Android 2.1, plus an ARMv7a compatible processor (you can find this info in the specs for your device). As always, "most" refers to within the US. You would think a global company like google could provide global support for their global apps. At least the time I have from not being able to use Google earth affords me plenty of time to post my thoughts on their non-global policies. Bring it to the milestone, the phone has the hardware and software needed, what else do you need. Can't find it. Milestone Eclair, Philippines. Can somebody from Google explain this? The blog post makes no mention of the limited availability of the application. Is this US only or what? im using Google Nexus One, with Froyo 2.2. but still can't find google earth on market..
any good reason not available in Greece all that time? Not found in the Android Market - Motorola Milestone (UK). As far as I can remember, Earth has never been available on the UK Market, at least not from my phone. Does anyone know where I can download the apk directly? C'mon Google, this isn't good enough. I don't care who's fault it is - you should make it happen! "The requested item could not be found"
are you google guys do read any of these comments? NOT FOUND ON HTC HERO!!! @Elmar: Can't you read the comments? DOES NOT WORK ON ANY FIRST GEN ANDROID PHONES! That means the Hero. The processor is too wimpy to handle the graphics. Get a newer phone if you need to use Google Earth. I can't search Google Earth 1.1 from the market. In fact, no Google Earth can be search (even 1.0) after I upgrade to froyo. Please make it working on HTC wildfire!